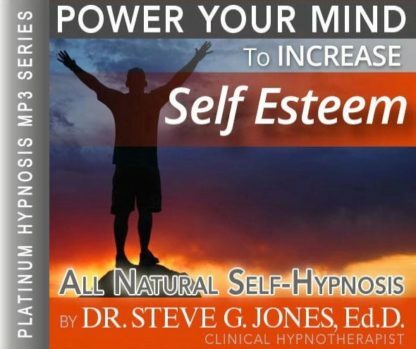 This Increase Self Esteem Hypnosis MP3 Download will give you the jump-start you need !!! Low self esteem can develop in many ways. An increase self esteem hypnosis mp3 download gets to the root of the cause and can help develop new ideas and dialogs about how you view yourself. This is true no matter what kind of upbringing a person had or what type of events have happened in their life to harm their self esteem. The Increase Self Esteem Hypnosis MP3 can help! Self esteem is defined as a person’s view of them self. It is often not based on reality but only on how the person appraises him or herself. They may have thoughts that they are not attractive enough or smart enough. It can be very general in that they feel they are just not “good” enough. It also can be targeted to a specific trait they don’t see that they have but want to have, such not being able to recognize that they have a talent singing when they do in fact sing well. Self esteem can also translate into behaviors and emotions based on this self perception. It can make a person shy and quiet if they have low self esteem. Both the negative thoughts and personality traits that develop from them can be changed with hypnotherapy. Hypnosis can actually replace the internal dialog a person with low self esteem plays in their mind with a more positive script. To allow hypnosis to replace one dialog with another, the person is first led into a completely relaxed state. This is the type of deep relaxation that takes place prior to falling asleep. Once this is achieved, then messages of self-worth and positive reinforcement can be introduced. Since it is the subconscious mind that holds the negative thoughts leading to low self esteem, the subconscious mind is cleansed of these thoughts and filled with the positive message. 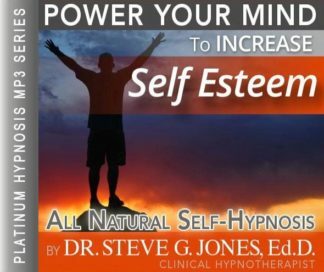 Steve G. Jones, a clinical hypnotherapist, expertly accomplishes this in his Increase Self Esteem Hypnosis MP3 audio. Steve G. Jones, Ed.D., Clinical Hypnotherapist, charges $1,500 for a custom recording and $25,000 for a one-hour private hypnotherapy session at his office. But you can get all the benefits for this low price. Simply listen to the Increase Self Esteem Hypnosis MP3 download every night as you go to bed for three weeks and feel the changes happening in your life. You will feel more empowered, more in touch with your true self, and you will truly know that your goals are within your reach. Steve G. Jones achieves AMAZING and LASTING results!!! Hypnosis is the easiest way to affect change in your life because the positive messages go straight to your subconscious mind effortlessly so you can accomplish your goals and reach for the stars!! All you have to do is listen to the Increase Self Esteem Hypnosis MP3 recording at night as you go to sleep!!! You’ll hear soft music, the gentle sounds of the beach, and the soothing sound of Steve G. Jones’ voice all working together to bring about positive changes in your life easily and naturally. Steve G. Jones has been helping people improve their lives with hypnosis for over 17 years…now it’s time for him to help YOU… don’t wait, do it NOW !!! you’ll be glad you did. See you at the top! Whenever you are a little down or not very confident in yourself, I want you to tell yourself that you are smart, capable, attractive, and a great person. You deserve the best that life has to offer. Many people suffer from low self-esteem. There is so much pressure in our every day lives, it’s hard not to get down on ourselves once in awhile. But even when you are not feeling very confident in yourself, it’s important to have a positive attitude and know that you are worthy of great things. We can’t all be good at everything. There are some things in life that we are better at then others. It’s important to focus on the things that we are good at instead of dwelling on the things that we’re not the best at. It’s important to carry your head up high and not let little things get to you. Remember, you are smart, capable, attractive and a great person! As most people have come to discover, self-esteem is something that is an integral part of happiness. Literally, it is the regard one has for his or her character, and the faith had in his or her abilities. Holding yourself in high regard and believing in your abilities is synonymous with having a healthy self-esteem. However, it is not always the case that someone has enough self-assurance to feel this way about their self-worth. Low self-esteem predicts other psychological and emotional problems, such as anxiety and depression (Fraser 2012). Hypnosis is a treatment option that has been extremely successful and effective in treating low self-esteem and directly reducing the risk of all the negativity and unhappiness that comes along with unhealthy low levels. While self-help books and videos are what many turn to, the literature shows that these can often be unfortunately detrimental to the situation, since when a person cannot manage to live up to the expectations for improvement, the patient will feel even worse (Wood et al. 2009, Fraser 2012). However, a an increase self esteem hypnosis mp3 download is a viable and more reliable option to help a person feel better about himself or herself and believe in their abilities. By reversing negative thinking and encouraging someone to put himself or herself first, it increases self-assurance which raises feelings of self-worth. An Increase Self Esteem Hypnosis MP3 download can make you happy and satisfied with yourself! There are a few things that need to be remembered when someone is not experiencing a healthy self-esteem and wants to improve it with hypnotherapy. The first idea to keep in mind is that self-esteem is not a fixed state or immutable; it is possible to make changes to one’s self esteem and incorporate things that are learned or experienced over time (Baumeister et al. 2003). The second thing to keep in mind is that even when one is not aware or preoccupied with it, self-esteem is being affected by interactions, relationships and the views of others. Some evolutionary psychologists are of the opinion that the self-esteem someone has is actually a consequence of their interpersonal relationships. What that means is that if someone receives feedback that is positive, or experiences acceptance, their self-esteem will increase, but conversely, if they receive feedback that is negative, or experience rejection, self-esteem will decrease. In other words, the degree to which one thinks he or she is of value to others or the degree to which someone feels accepted by others is also a measure their self-esteem, and this perspective is called the Sociometer theory (Leary 2005). Given how vulnerable self-esteem is to being influenced by what other people think, increasing self-esteem is a process that must be focused on internally, such that a requirement for success is that the changes are specifically inner changes. If it is established within, independently of all that is external, it can be robust enough to counteract or combat whatever might threaten to lower it. Hypnosis is an appropriate and desirable option for anyone who wants to make positive changes to their self-esteem, and a lot of research has been done within in the scientific community that supports it. The hypnotherapy technique of ego-strengthening directly alters the core beliefs that characterize self-esteem and (perceived) self-efficacy. Additionally, indirect methods are also very useful, such as resolutions of psychic inner conflict or a lessening of the feelings, thoughts and behaviors that cause distress (Stafrace 2004). A study done at the University of Stellenbosch in South Africa using one hundred twenty students was designed to see whether hypnosis could be used as a tool for improving the self-esteem, or self-concept. These students were randomly selected from a population of five hundred sixty four second-year undergraduate psychology students, which is meaningful because it demonstrates how applicable the results are to much larger groups. There were a total of three groups, two experimental groups and one control group. A control group is the group that did not experience the hypnosis portion of the protocol, in order to measure the significance of the results against some reference point of what would have happened if hypnosis had not been implemented. One experimental group was exposed to an active alert hypnosis style and the other experimental group was exposed to a relaxation hypnosis style. Both were exposed once a week to their respective hypnosis sessions for an eight week period. The control group received a basic type of relaxation session that did not utilize hypnosis or any hypnotherapy techniques. The results of this study showed that both of the hypnosis experimental groups had increased self-concept, and experienced a positive change to self-esteem as a consequence of their hypnosis exposure (De Vos and Louw 2009). Since surgical treatment for cancer causes a lot of different issues for patients including the relevant one of self-esteem (often due to changes in body image after procedures), various treatments have been studied to determine which helps these individuals. Often, the cancers will make an individual experience self-blame even though they logically know it was not their doing (Phelan et al. 2013). Hypnotherapy has been used not only for pain management and re-establishing sexuality and intimacy, but it also addresses the self-esteem issues that crop up post-surgery. It has even helped in cases that can seem drastic, namely cases where individuals have to cope with the far-reaching self-esteem changes produced by bodily disfiguration or genital removal (Stephan 2013). Two hundred sixty one veterans who were admitted to Substance Abuse Residential Rehabilitation Treatment Programs participated in study that was evaluating hypnosis as a treatment for them as chronic drug and alcohol patients. Just to emphasize, these are individuals who not only fought in a war, (which is a highly stressful and intense experience that surely has effects on self-esteem,) but have also suffered with the shame and guilt of using drugs and alcohol to cope with their suffering and this is clearly something that impacts self-esteem. One of the things the researchers were investigating was if hypnosis increased self-esteem since that is a very important component of addiction and relapse. There was one group that had minimal exposure to hypnosis, one group with high level exposure, and a control group. The subjects were assessed before and after the regimen and then again at a seven week follow-up. The two hypnosis groups both had significant increases in the self-esteem levels and the one with high level exposure had the biggest increase and as expected, the minimal exposure group had a smaller increase (Pekala et al. 2004). This means that the hypnosis treatment considerably helped these veterans that had chronic substance abuse problems. This experiment is especially convincing as it was done with extreme individuals that one would imagine have had experiences that could make self-esteem especially low. When it comes to treating physical chronic pain, medical professionals have found that it is a feedback loop where the pain is able to affect overall functioning as well as emotional states, and then these can then affect the chronic pain. To effectively treat chronic pain, it is important to also treat that individual’s subsequent lowered morale and decreased self-regard, since they begin to believe they deserve the pain, and negative thoughts like that combined with several other illogical beliefs that reduce feelings of self-worth will lead to low self-esteem. This is also why sometimes using hypnosis to treat a specific site of pain can result in the pain being removed from that area but, because the psychological states have not been treated, the pain just transfers to another site. In the case of a man suffering from chronic pain and a low-esteem that was directly related to it, hypnotherapy proved to result in positive results that enhanced his self-esteem. In addition, he experienced enriched socialization, better workplace relations and improvements in general functioning (Suey 2010). As researchers have learned, low self-esteem increases the risk of additional emotional and psychological problems, such as depression and anxiety. In an analysis of many case studies where hypnosis was used to treat patients, a significant number of clients showed significant improvements. Diminished depression and anxiety were apparent after participants completed just seven hypnosis therapy sessions (Elliot 2010). Findings such as this are very motivational for not just depressed or anxious people, but those who are at risk because they suffer from self-esteem which is undoubtedly related. In one study involving two hundred twenty four undergraduate students as participants, the effects of ego-strengthening hypnosis techniques were examined after a week of treatment to see if they would improve both self-esteem and depression. There was an experimental group that received the hypnotherapy and a control group to compare to that received a regularly used relaxation session instead. The results of this experiment showed that ego-strengthening did in fact help both self-esteem and depression, both measured by the psychometric tools of standardized tests and specific protocols, in order for the researchers to be confident in the evidence (Lavertue et al. 2002). One twenty seven year old woman had been suffering from all three issues, a depression, anxiety and low self-esteem trifecta, for most of her teenage and adult life. The use of clinical hypnosis proved to be a useful and important part of her therapeutic treatment. By taking advantage of the flexibility possible in thoughts, emotions and behaviors that few treatments get right to the core of the way hypnotherapy does, her therapy was greatly enhanced by the addition of hypnosis. She built a healthy sense of self and healthy self-esteem, and learned to be her own person, in touch with her values and beliefs, without feeling the pressure from others for how she should be . She developed a stronger sense of self through hypnosis techniques like ego-strengthening and ultimately, fortunately for her, the treatment was successful (Kellis 2010). By adding hypnosis to her therapy sessions, she experienced a host of other accomplishments that hypnotherapy is known to produce, many of which are related to, or necessary, for self-esteem. These are raised confidence, improved coping skills, focus shifted to successes rather than failures, positive cognitive restructuring, increased tolerance for frustration, enhanced relaxation abilities, and a better sense of control of what happens to oneself (Alladin 2010, Kahn 2010, Yapko 2001 and 2003). Positive changes in one’s self-esteem are possible and cause a cascade of additional positive effects as well. Hypnosis is a valuable tool that can be used to completely bypass external influences on self-esteem and get right to the root cause or causes. It will help you put yourself first, increase your feelings of self-worth and reverse your negative thinking. You can and deserve to feel better about yourself and believe in your abilities, and most importantly, being happy with yourself. Wood JV, Perunovic WE, Lee JW. 2009 Jul 1. Positive Self-Statements Power for Some, Peril for Others. Yapko M. 2001. Treating depression with hypnosis: Integrating cognitive–behavioural and strategic approaches. And as you continue relaxing deeper, deeper and more deeply relaxed, I would like you now to realize just how powerful you are. You are a very powerful, amazing, wonderful person. I would like you now to imagine yourself in a reflection in a mirror. You are standing in front of a mirror, looking at your reflection. Take a good look. Notice how amazing you are. Notice how attractive you are. You are very attractive. Day by day you will begin to notice these things more and more. Look how smart and intelligent you look. You’re a very smart, very intelligent, very attractive person. Look at yourself now in that mirror and notice these things, these things are very obvious to you and everyone around you, everyone in your life, everyone you know, everyone you will know. They will all notice these things, your attractiveness, how smart you are and how intelligent you are. You are a wonderful, positive, beautiful person. I would like you now to imagine three things about you which make you unique and wonderful, three things. Perhaps it’s how kind you are, how big-hearted you are. Perhaps it’s your perseverance, your creativity. Just three things about you that make you wonderful and unique. It’s easy for you to think of these things now and each time you listen to this recording, perhaps you can think of three new things that make you wonderful and unique. I want you to know that these things are not a secret, they are known to everyone. How wonderful you are is well-known. The next time you talk to someone, understand that they are seeing those wonderful qualities in you. Clearly and easily because your wonderful qualities shine through in your conversation, in what you do, and in who you are. Take a deep breath in now, and breathe in that sense of confidence that comes with being a wonderful person. And as you exhale slowly, let go of any negative thoughts, they are no longer a part of you. And continue breathing easily, effortlessly, and comfortably. Day by day your self-esteem is improving. You realize that you are a very powerful, wonderful, amazing, beautiful, intelligent, smart person. And you have so many other qualities in addition to these qualities. In fact, the wonderful qualities you have are limitless. You have an infinite number of wonderful qualities. Day by day you will realize them and this will help you feel good about yourself. Full of a powerful sense of love for yourself. And you use this energy in the most purchaseive way. You are kind to others and you are kind to yourself. You respect yourself. So you avoid situations which do not honor you because you deserve honor and respect. So you only put yourself in situations which honor you and you avoid negative situations. And this enhances your wonderful self esteem even further because every day you look for something you can do for yourself, something wonderful that you can do for yourself and you do it. Something that shows you how wonderful you are. You do this for yourself because you honor and respect yourself and you treat yourself right. You eat properly, you exercise properly, you have fun, you enjoy life. You do all of these things because you respect yourself. You allow yourself to engage in all of these positive, wonderful activities because you respect yourself. You have a wonderful, powerful sense of self-esteem. You are a wonderful, amazing person. Your self-esteem started growing when you were a very young child. Through the years, your life experiences have come to shape your self-esteem. If you have low self-esteem, then it is important for you to work on your confidence levels and give yourself a boost in self-esteem. Hypnosis is a great tool to use to overcome low self-esteem. Hypnotherapy targets your thoughts, feelings, perceptions, and past experiences that shape your current self-esteem. You deserve to live a life with full confidence in yourself. This powerful self-hypnosis session will give you the boost in self-esteem that you need, want, and deserve. We suggest you listen to the Overcome Low Self-Esteem hypnosis recording for 21 nights in a row before going to sleep each night. You will hear the relaxing voice of Steve G. Jones help you relax and put your mind at ease. You will slowly go deeper into a state of relaxation, known as hypnosis. Then your subconscious mind will hear powerful suggestions that will help you overcome low self-esteem.